“She is a one-of-a-kind talent on and off the field, and we don’t get players like that ever,” said Stingers head coach Graeme McGravie. Tittley was the driving force behind her team’s three appearances at the CIS national championships, leading her team to a silver medal in 2010. Seen as a mentor and leader by her teammates, Tittley earned high praise from Stingers centre Bianca Farella. Tittley is departing the Stingers organization after her fifth year with the club, the maximum allowed time, according to CIS regulations. “To come out on top in my last year was a golden moment,” she said of the Stingers’ Réseau du sport étudiant du Québec championship title. Over the years, she’s had her fair share of success, including three consecutive CIS All-Canadian honours from 2008-2010. But her favourite moment came on Oct. 27, when she and the Stingers narrowly defeated the Laval Rouge et Or 35-34 in this year’s RSEQ provincial final. “It was one of the best games that we ever had in that rivalry,” said Tittley. Meanwhile, she is still trying to get over her team’s 2010 loss to the St. Francis Xavier X-Women at Nationals. “That game in [Peterborough, ON] was rough. 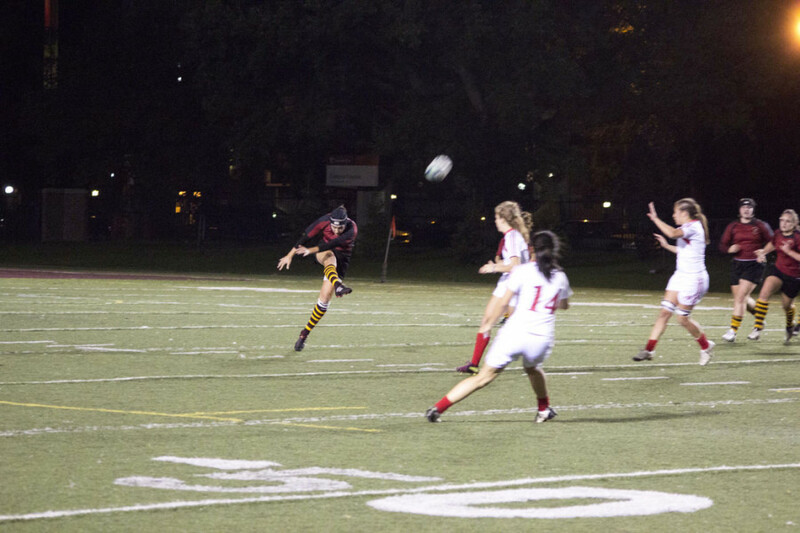 At the same time, I never want to forget that experience,” she said referring to the gold-medal game, where the Stingers’ opposition scored a try in the game’s second overtime. With her Stingers career finished, Tittley wants to focus more on her coaching career—with hopes of doing it professionally. “I always want to be a part of the game; it’s a big part of my life,” she said. Tittley currently serves as head coach of the St. Thomas Cavaliers Juvenile Girls, a team she’s coached for six years, and the team she started her rugby career with 12 years ago at her high school in Pointe Claire, QC. As for her playing career, she’s uncertain if she wants to continue playing professionally. “In terms of the elite level, I haven’t made any definite decisions on that note yet,” she admitted, who’s also had stints playing rugby for the John Abbott Islanders, and the Montreal Barbarians. But as Tittley prepares her future, the Stingers will be left hoping for someone fill the void. “I’m not sure you can replace what she brought to this program and to the teams she played on, but I’m going to keep looking and we’re just going to have to see what the future holds for our program now that she’s graduated,” said McGravie. “I think everyone is going to have to step it up a bit, and the natural leaders on our team will emerge once Jackie is gone,” said Farella.